This level has medium difficulty. For this level try to play more from bottom part of the board or play near to blockers to blockers to break them. Combine them with each other to break more blockers or play near to Orange border to get more chance to collect the Monklings. I’m playing on the iPhone and this level requires 3 monklings! Nightmare! I’ve seen videos from 5 days ago and it’s only 2 required, what’s up with that? ? On my phone it wants 5 monk lungs and is a hard level. 3 monklings on phone, laptop, tablet seems impossible every video I watch only requires 2 !!!!! I agree with all the other comments this level is unreal.I have 3 monkeys to capture, all of the videos show 2. I believe this level require more moves. I really am hooked on candy crush jelly. I’m on level 305…omg I believe I’m going to have to give up! This is unreal,,can not get thru!? hate to delete this game !! 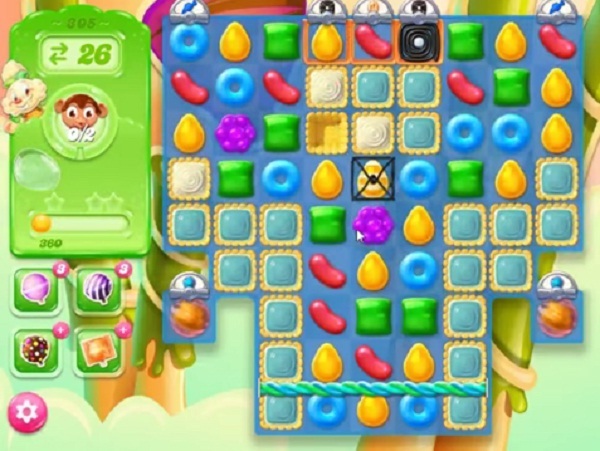 Have to activate the coloring candies to make orange candies, so have to use exactly placed striped candies or boosters as fish are not intetesred. I wish these tippets were more helpful.